LYNDON—It’s always the roads – at least that’s a common topic of discussion between county commissioners and constituents. 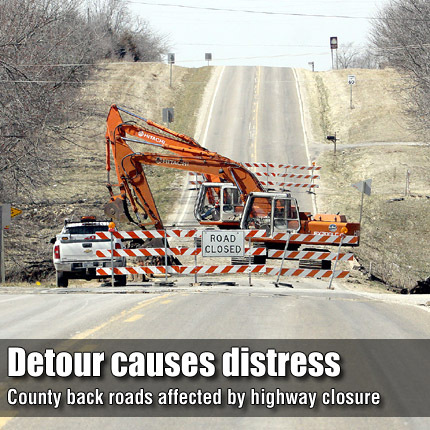 Osage County Commissioner Ken Kuykendall reported Monday that a road being used as an unofficial detour has generated the most calls to him lately. With U.S. Highway 56 closed between U.S. Highway 75 and Scranton for a bridge repair project, a three-mile stretch of county road 173rd Street is being used as an unofficial detour by many drivers going to and from U.S. 75 and Scranton and Burlingame. The state’s official detour for U.S. 56 directs drivers to state Highway 31, through Osage City, then back to U.S. 56. After meeting with Osage County Sheriff Laurie Dunn to discuss lease-purchase of three new sheriff’s vehicles, Kuykendall made a request to Dunn regarding drivers on 173rd Street. “Could you get your guys to drive on 173rd?” Kuykendall said. He said complaints he had received were about people speeding on the road and the increased traffic creating large amounts of dust. Dunn noted the speed limit on all county roads is 55 mph unless otherwise posted. Kuykendall said the county road and bridge department has posted advisory speed limit signs in an attempt to slow the traffic. He said the state has agreed to pay for dust control application due to detoured traffic. “It’s not the official detour but the state is paying for dust control because everybody is driving on it,” he said. He said the dust control application would not be applied immediately due to wet weather, which dilutes the chemical’s effectiveness. The county has commonly sprayed magnesium chloride on roads during previous dust control programs. In other driving discussion, commissioners were questioned by Osage County Attorney Brandon Jones about whether county employees were required to take defensive driving classes before driving county vehicles. Jones said he could not find the requirement in the county’s employee policies, and commissioners confirmed it was not a requirement. Jones said the county’s liability insurance provider had suggested that county employees who drive county vehicles should take defensive driving classes every two years. He said that one benefit could be reduced insurance rates for the county and the drivers. “We probably ought to put it in the handbook,” Kuykendall said. Jones, who is reviewing the employee handbook, said he could draft a policy for the commissioners’ approval. Also discussed with Jones was the ongoing prosecution of James Kraig Kahler. Jones said a psychologist hired by the state was at the county jail Monday to evaluate Kahler, who is accused of killing his wife, two teenage daughters, and his wife’s grandmother in Burlingame in 2009. Jones said the county would be paying for food, lodging and travel expenses for two defense witnesses from Texas, as per a request made during a hearing March 17. He said the county is responsible for defense witness expenses during the trial. Jones said Osage County District Court Judge Phillip Fromme had agreed the witnesses could be brought from Texas at the county’s expense, but their involvement in the trial should be kept to as few days as possible. Kuykendall agreed the county would need to bear the expense, “but we don’t have to feed them T-bones,” he said. Jones said the expense amounts requested by defense attorneys were also questioned by the judge and the prosecution. He noted the per diem rates were more than customary for county and state employees. Commissioners considered where witnesses for the trial would be housed, pointing to the Lamont Hill resort as the only motel in the county. “Maybe we could get a deal to rent all of Lamont Hill for two weeks,” Kuykendall said. Commissioners also discussed other nearby motels such as one at Beto Junction and another at Lebo. Jones also informed commissioners that as the trial drew closer, the prosecution would occupy his time. “Starting in July, that’s all I’m going to be working on,” Jones said. Jones said he had enlisted Coffey County Attorney Doug Witteman to serve as Jones’ stand-in for other criminal cases that might arise during the planned four-week trial. Commissioners asked Dunn about planned security measures during the trial, and she said they would include temporary installation of metal detectors in the courthouse. • approved a three-year lease-purchase agreement for sheriff’s vehicles, including a 2011 Ford Crown Victoria, to be used as a jail transport vehicle, two 2011 Chevrolet Impalas, and a 2011 Chevrolet Colorado four-wheel drive crew cab pickup. First Security Bank of Overbrook offered the winning bid of 3.2 percent to finance the purchase. Other bidders were Citizens State Bank of Lyndon at 3.33 percent, and First State Bank of Burlingame, 5.99 percent. The cost of the vehicles is $86,465.73 before trade-in agreements. • heard an inquiry from Joyce Lacey, Melvern, about fees charged at the county waste transfer station for cities that have citywide cleanups. Commissioners said the county is required to pay for all waste hauled from the site and those costs are collected from everyone that dumps waste there. Commissioners also agreed the county and the city of Melvern could cooperate in providing a recycling collection point in Melvern. Lacey, who is running for mayor of Melvern, was asked to attend another commission meeting if and when she takes office. It was noted no opponents had filed for the mayor position. • met with Osage County Economic Development Director Stephanie Watson, who presented a draft of a county economic development strategic plan. • was notified that all of the courthouse windows had been welded shut by road and bridge department employees as part of a weatherizing project. A contractor is to caulk all of the windows to complete the project. • approved a payment of $3,316.49 to Postal Presort, Wichita, for mailing property tax valuation notices, to be paid from the appraiser’s fund. The notices are to be mailed April 1.